Installing wall tile is a four-stage process involving surface prep, layout, applying adhesive and tiles, and grouting the tiles. Surface prep and choosing an adhesive are based on the tile location, while the other aspects are more or less standard for every job. 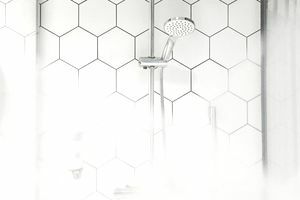 Simple tile applications, such as backsplashes, are reasonable for most builders to tackle, but specialty jobs, like complex shower walls or steam rooms, are best left to tile contractors. Wall tiles can be installed over drywall and plaster, but in wet areas, they should be installed over cement backer board or cementboard. Cementboard is not waterproof (water and water vapor can pass through it), but it does not break down if it gets wet, as drywall and plaster do. Make sure that the surface is clean, smooth, flat, and dry. If the wall is painted, it's a good idea to sand the surface prior to installation. Begin the tile layout by finding the center of the wall, then use a level to create intersecting vertical and horizontal layout lines. Test-fit a full horizontal row and a vertical column of tiles along the lines to see how the tiles fit the area. Adjust the layout lines as needed for the best appearance. Remember to include spaces for grout joints when testing the layout. You can use pre-mixed mastic adhesive for wall tile in dry locations. For showers and other wet areas, use cement-based thin-set adhesive, which adheres to cementboard and, like cementboard, won't break down if it gets wet. Prepare the adhesive as directed by the manufacturer. Apply the adhesive to the wall with a notched trowel, holding the trowel at about 45 degrees so the furrows of adhesive are uniform in height. Do not hide the layout lines with the adhesive. Place the first row and column of tiles along the layout lines, pressing the tiles firmly and twisting them slightly to embed them into the adhesive. Do not slide the tiles into position. Use tile spacers to set consistent gaps for grout joists, as needed. Most wall tiles have built-in lugs that automatically set the grout gaps. Install the remaining tiles, working from the first row and column. If you are tiling a shower or tub surround, leave a 1/8-inch space between the tile and the tub or shower base to provide an empty space for caulk. Do the same if you are installing wall tile all the way to a floor or countertop. This space will be filled with caulk, which allows for movement of the horizontal surface. Grouting this space leaves the grout vulnerable to cracking. During the wall tile installation process, you will likely need to cut some tiles to fit. You can make straight cuts on tiles with a manual tile cutter or a tile wet saw. Use tile nippers for curved cuts. Nippers create rough edges that you can smooth somewhat with 80-grit sandpaper. You can also make a clean hole through the center of a tile with a drill and a tile-cutting hole saw. Grouting happens after the tile adhesive has fully cured. Choose unsanded or sanded grout based on the width of the grout joints: For joints, up to 1/8 inch wide, use unsanded grout; for joints larger than 1/8 inch, use sanded grout. Remove the tile spacers, as applicable, before grouting. Mix the grout as directed by the manufacturer. Apply the grout with a rubber grout float, pressing the grout firmly into the joint spaces. Make a second pass diagonally across the tiles, holding the float at a steep angle, to remove excess grout from the tile surfaces. Gently wipe the tiles and joints with a grout sponge and clear water. Let the grout set up, then buff away any grout haze from the tile faces using a soft cloth. Finally, fill the empty gaps along shower bases, tubs, floors, and countertops with 100-percent silicone caulk.